Secretary of Agriculture Tom Vilsack announced today that USDA will all but abandon the food inspection system under which federal inspectors examine chicken and turkey carcasses on the slaughter line by sight, touch and smell and move to a modernized system stressing offline quality assurance. 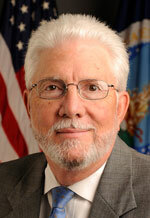 J. Dudley Butler has resigned as administrator of USDA’s Grain Inspection, Packers and Stockyards Administration, effective next week, USDA confirmed today. His resignation brings to an end a controversial tenure marked by an attempt to toughen regulations on livestock and poultry marketing. WASHINGTON — President Obama announced today he would ask Congress for the authority to consolidate several federal agencies dealing with trade and business development, including the Office of the U.S. Trade Representative (USTR), which negotiates agreements covering exports of beef, pork and poultry among many other products. Concerns were immediately raised that the consolidation could hamstring efforts to promote U.S. trade. Also affected by the consolidation would be the Commerce Department’s business and trade functions, the Small Business Administration, the Export-Import Bank, the Overseas Private Investment Corporation and the Trade and Development Agency. “We’d have one department where entrepreneurs can go from the day they come up with an idea and need a patent, to the day they start building a product and need financing for a warehouse, to the day they’re ready to export and need help breaking into new markets overseas,” Obama said. USDA’s Food Safety & Inspection Service will launch its long-awaited microbiological study of raw chicken parts this month, aiming to collect enough data to help set pathogen reduction performance standards for chicken breasts, wings, drumsticks and other parts. USDA standards are now based on whole chicken carcasses. The baseline will last about six months, the agency said. The study will provide the government and the industry with “data concerning the prevalence and quantitative levels of selected foodborne pathogens and microorganisms that serve as indicators of process control,” FSIS said in a notice released Monday. The notice is available at http://www.fsis.usda.gov/OPPDE/rdad/FSISNotices/04-12.pdf. USDA inspection personnel in each participating plant will collect samples of raw, unfrozen parts, shake them up in solution to get rinsate, and ship bottles of rinsate to a laboratory in Texas. The Food and Drug Administration is moving to ban many extra-label uses of cephalosporin drugs in cattle, swine, chickens, and turkeys, saying the drugs may cause failure of antibiotic treatment of life-threatening infections in humans. The industry says FDA has little evidence that a problem actually exists. FDA announced Wednesday that it will publish a notice in Friday’s Federal Register prohibiting the use of cephalosporin drugs in food animals for disease prevention purposes. The agency said it would also restrict other uses of the drugs to the doses, frequencies, duration, or routes of administration that are already approved, and also to the species and production classes already approved.